Star Trek: Mission New York, a convention running Sept. 2-4, will feature "Trek Talks" with NASA researchers and "Star Trek" cast members. 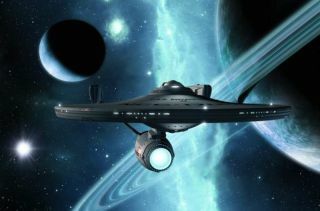 NASA astronauts, scientists and engineers will join "Star Trek" actors at the Star Trek: Mission New York convention on Labor Day weekend for a series of talks about alien planets, the franchise's influence on space-age technology and how to make first contact. The series of "Trek Talks" are free for attendees at the convention, which will be held Sept. 2-4 at the Javits Center in New York City. You can purchase tickets here. On Sept. 4 at 1:30 p.m. EDT, a NASA panel on the convention's main stage will discuss how the "Star Trek" ethos and technologies have inspired real NASA developments, and how the future of spaceflight will mirror and differ from the "Star Trek" version. The panel will feature Kjell Lindgren, NASA astronaut; Michelle Thaller, NASA's deputy director of science communications; Dave Lavery, a program executive for solar system exploration at NASA; Jeffrey Sheehy, a senior technical officer at NASA; and Adam Nimoy, TV director and son of Leonard Nimoy (aka Spock). It will be moderated by "Star Trek: Voyager" actor Robert Picardo. On Sept. 3 at 12:15 p.m. EDT, in a talk called "Ugly Bags of Mostly Water," NASA Jet Propulsion Laboratory scientist Bobak Ferdowsi, of "Mohawk Guy" fame, and Phil Plait (writer of Slate's "Bad Astronomy" blog), will discuss what real aliens might look like. Then, at 3:30 p.m. EDT, NASA scientists Matt Ritsko and Jeff Volosin will discuss different ways to find alien planets. Both Ritsko and Volosin work on the agency's Transiting Exoplanet Survey Satellite (TESS) project, which is currently in development. On Sept. 4 at 11:45 a.m. EDT, the two will return to discuss TESS in more detail, including how it will spot faraway planets and how its spacecraft will be built and managed. On Sept. 4 at 10:30 a.m. EDT, Dan Werthimer, chief scientist for SETI (search for extraterrestrial intelligence) at the University of California, Berkeley, and Ferdowsi will talk about first contact and the search for life in the universe. Other "Trek Talks" will focus on health care, literary references, fashion in the series and more.